Somerset House in London is a must go destination and always gives us reasons for numerous visits throughout the year. This time around, we visited Spring, its concept restaurant by Australian chef Skye Gyngell and her business partner Marie Jackson which opened last autumn; a restaurant which is sure to please your appetite with seasonal dishes and spoil your visual thirst with its warm elegant interiors, designed by architecture practise Stuart Forbes Associates in collaboration with Gyngell's sister Briony Fitzgerald. Lounge and banquettes, photo © Amber Rowlands. 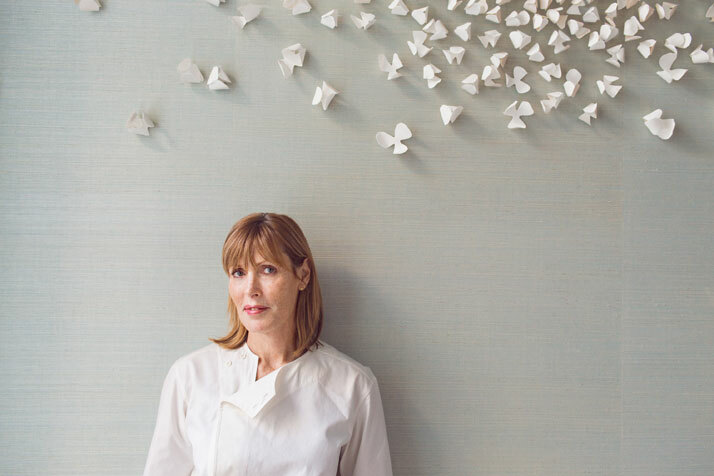 Skye Gyngell, photo © Amber Rowlands. The Garden Atrium, photo © Amber Rowlands. 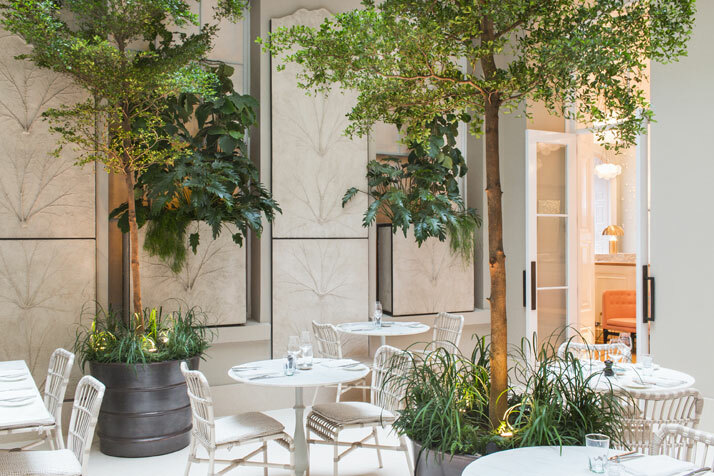 The restaurant itself is located in the New Wing, on the right-hand side of Somerset House’s imposing courtyard, and is accessed through a long corridor furnished with few tables and plants before entering Spring restaurant’s reception through a set of double glass doors. 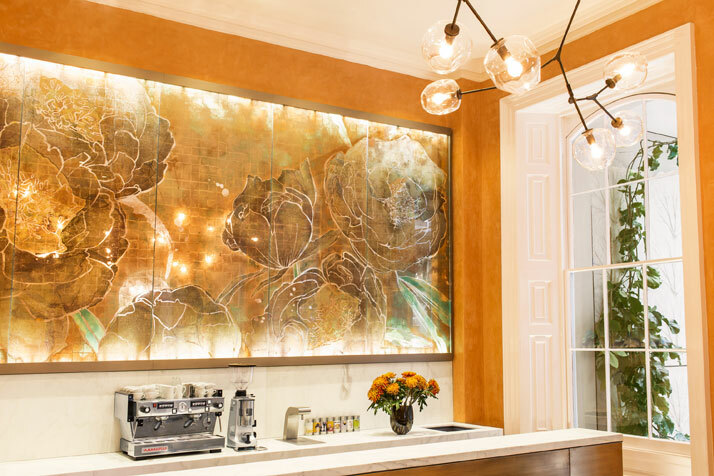 Entering the reception, separated from the main restaurant space, you are embraced by muted gold colours softly lit by Lindsey Adelman’s custom branching bubble chandelier. Here visitors can enjoy a relaxed aperitif either in the bar or outside on the patio with its marble top tables and olive trees reminiscent of European internal courtyards. Dressed in a custom made uniform (all uniforms were designed by Trager Delaney), our lovely hostess informs us that this area will be used as a bar area for non diners in the future. Ice creams from the Salon, photo © Amber Rowlands. Continuing through into the restaurant, there is a set of inviting &tradition’s Mayor sofas in the waiting area. The rest of the space is painted in white and pastel pink, with one wall adorned with 300 white ceramic petals, an art piece by Brazilian artist Valeria Nascimento. 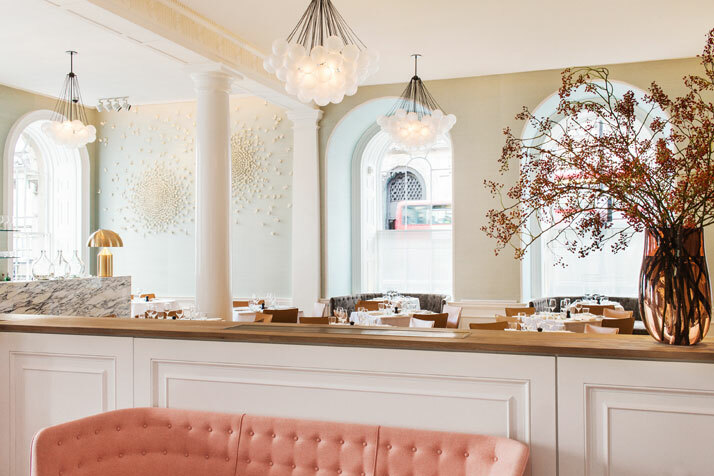 Cloud like chandeliers formed out of opaque glass balls float over plants and fresh flowers generously spread throughout tastefully referencing the restaurant’s name and concept. To the left, two of Vico Magistretti’s Atollo brass table lamps dominate a simple white marble bar. During daytime, plentiful daylight washes the space coming through its round top windows dressed with contemporary and subtle embroidered curtains. 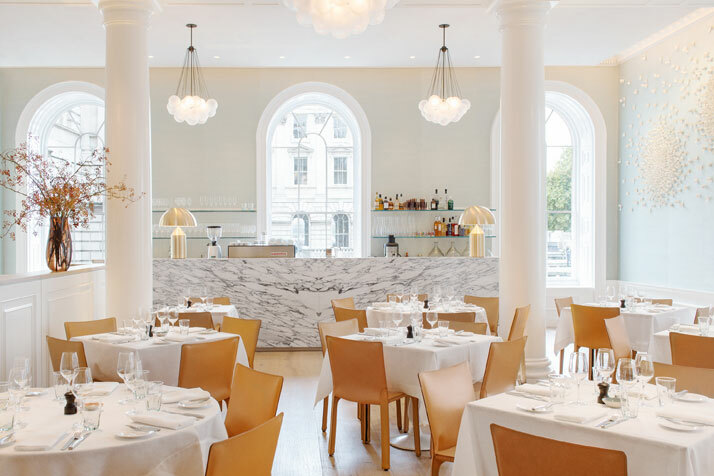 A tasteful addition to London’s rich list of elegant eateries, Spring restaurant is definitely one of its rising stars. Dining room, photo © Amber Rowlands. 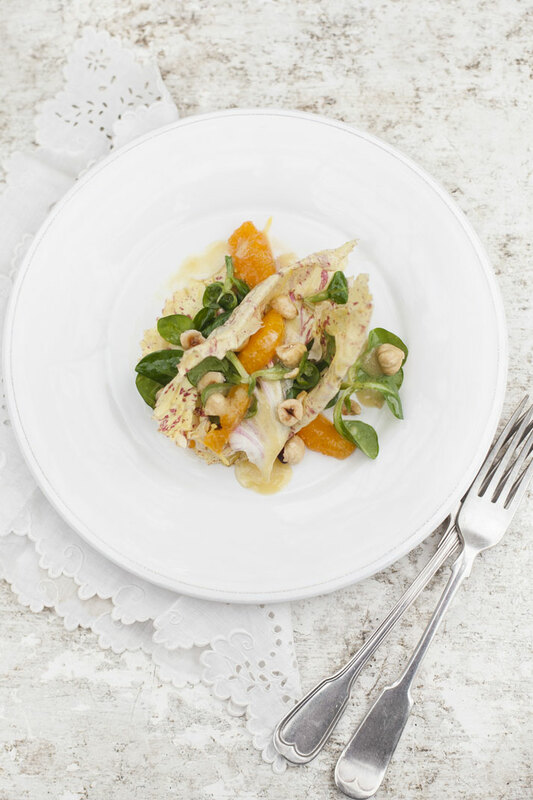 Castelfranco, clementine and hazlenut salad, photo © Lisa Barber. 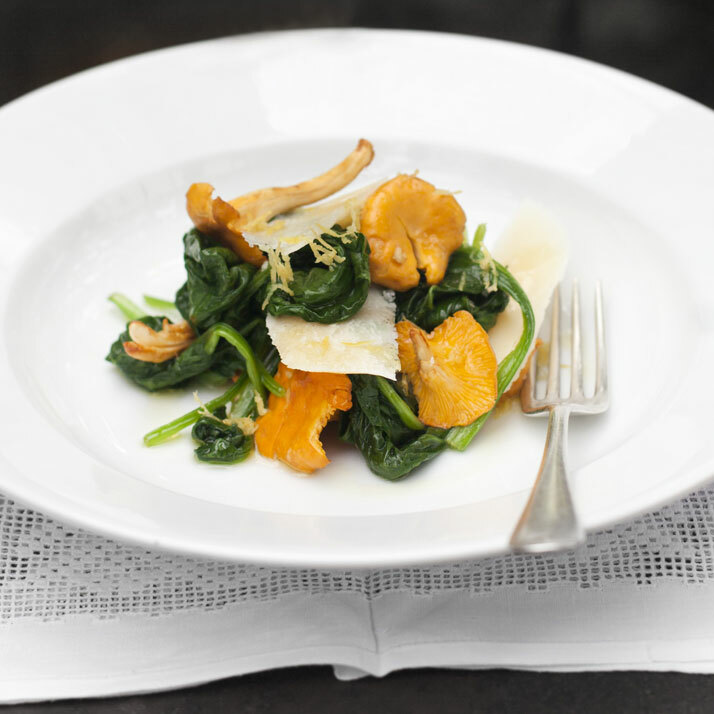 Salad of raw girolles, spinach, aged parmesan and creme fraiche, photo © Lisa Barber.